Did you know that you have the same access to God the Father that Jesus has? Meeting God Face to Face is a 365-day devotional based on Bill Johnson’s best-selling book Face to Face With God.Each day’s reflection contains a Scripture verse, a short reading, a highlighted point to ponder, and lines for journaling. Much of the content of this devotional and its companion book, Face to Face With God, was first preached by Bill Johnson in 2002. This message became his whole life—a life devoted to discovering and hosting the presence of God. Pursuing this goal has been costly, but it did not prevent him from making it his sole reason for living. If you desire to grow in intimacy with God and develop a stronger sense of and appreciation for His presence, this book is for you! Deepen your relationship with God by pursuing His favor and continuing the spiritual journey you started through Face to Face With God. This is one of the best devotionals I have read since Jesus Calling by Sarah Young. Bill challenges the reader in a small paragraph to go deeper with God. You start with a passage of scripture the sets your heart ready to hear Bill’s thoughts. It stirred my heart and drew me closer to Jesus. It ends with a point to reflect on and a place to write your thoughts. I highly recommend this devotional. If you don’t have a lot of time but want to encounter God’s presence and set the tone for your day, pick up this book. I always get excited when I see a Bill Johnson book come out. I enjoy hearing him speak, he is full of humble wisdom. But, if I am honest, I haven’t found a book yet that I love by him. That doesn’t mean this book isn’t good. It is. It is full of Godly wisdom that you can definitely apply and use but I found my mind wandering and I would have to go back and read. I’m sure it’s me and for whatever reason his writing style doesn’t capture me. But, as I said, this book really is full of wisdom and ways to raise our children to be giant-killers. A copy of this book was given to me though Netgalley.com. All opinions are my own. If you could sit down and talk privately with two world-renowned leaders in healing ministry–away from the spotlights, stages, and eager crowds–this is the conversation you would have! These real-life reflections from two soldiers on the front lines of healing ministry will inspire your own obedience to God’s voice, your deeper faith that God is at work, and your trust in his power to bring the answers you need. Yeah, these two men are so inspiring. There is no way you can read this book and not want what they have, what Jesus has. This book will rock your world. This book didn’t start out that way, it was supposed to only be a DVD but they decided to put it in book format and I am so grateful they did. I love what Bill said in one chapter, “…action releases faith.” I so believe that. Sometimes we have to move and that will release our faith. Sometimes we have to raise our hands, get out of the pew. This book has reminded me of what I really am missing in my faith, things that the world has pushed out in the busyness of life. I want to get back to that faith? How about you? When people are in love they dream together. The same is true for your relationship with God. He wants to share the secrets of His heart—His thoughts, plans and purposes—with you. The Maker of Heaven and Earth wants to dream with you! Bill Johnson is a fifth-generation pastor with a rich heritage in the Holy Spirit. Bill and his wife, Beni, are senior pastors of Bethel Church in Redding, California, and serve a growing number of churches that cross denominational lines, demonstrate power, and partner for revival. Bill’s vision is for all believers to experience God’s presence and operate in the miraculous—as expressed in his bestselling books When Heaven Invades Earth and Hosting the Presence. The Johnsons have three children and nine grandchildren. I enjoy Bill Johnson very much. If you have never read any of his books or listened to any of sermons I highly recommend any and all. He is on fire for the Lord and it is contagious. So I was very excited to get my hands on this little book. This book will give you a little bit of Bill Johnson wisdom every day. He challenges the reader to truly rely on God for all things, to co-labor with Him, to be creative and not afraid of a challenge. You will be reminded daily of the inviation God offers us to partner with Him, I pray you will take that challenge. Two realities are evident in today’s broken world: Our culture is in desperate need, and our God is a miracle-working God. How do believers answer the world’s cries for help in a way that exhibits God’s heart of compassion? According to bestselling author Bill Johnson, we simply embrace two additional realities: God’s wisdom and his power. 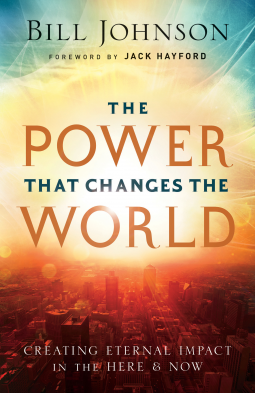 With biblical insight and extensive experience of seeing God’s hand at work, Johnson offers keys to how believers can have the greatest impact on society. When we understand the long-term strategy of God’s wisdom and the immediacy of his miracle-working power, we can create eternal impact and significance in the here and now, whether in our own lives and communities or in the farthest reaches of the world. This book will challenge you to have a impact right where you live, in the areas in which you work and share community. Not just church. Actually, Bill shares that our greatest job might just be the influence we have on our communities outside the church walls with “pre-believers”. Wisdom. I have just finished reading through Proverbs and wisdom is so important. The only way for us to gain wisdom is to be in the Father’s presence. We must take time to do that. When we do we will see not only our life transformed but those around us too because of the love that overflows from us onto them. I could share so many more wonderful quotes from this book, but really you should just read it. It really is so good and Bill is such a good teacher, whether you’re listening to him speak or reading one of his books. Grab your copy at your local bookstore, Amazon, Barnes and Noble, Christianbook.com, Books-A-Million, Deeper Shopping or your favorite retailer.